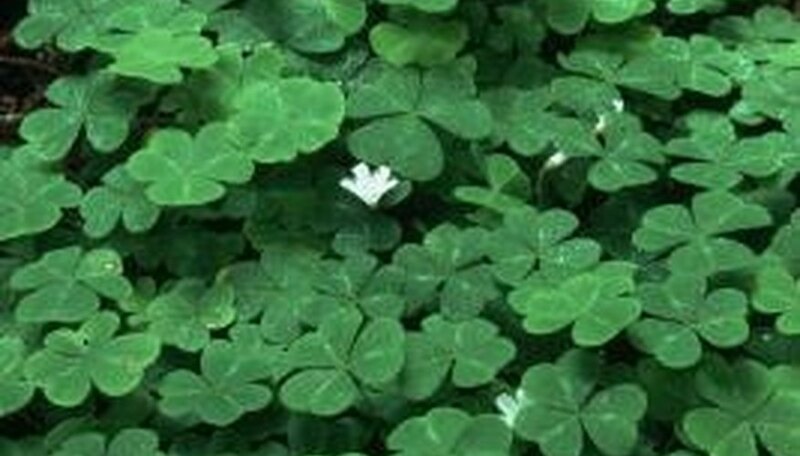 Oxalis plants are familiar as spring shamrocks, sold in grocery stores in March. In addition to the houseplants, there are approximately 500 species of Oxalis, many known as sorrels, wood sorrels and even a buttercup. Native to many parts of the world, these plants may be perennials or tender perennials that grow as annuals. Oxalis species average 1 foot tall, with three-leaf formations at the ends of delicate stems. Oxalis plants are herbaceous, growing from bulbs or tubers in little clumps. Oxalis also self-pollinate, meaning that pollen from one flower can fertilize another on the same plant, a trait that increases the plant's chances for survival. Tiny five-petalled flowers bloom from spring through fall in colors from the common yellow to white, rose, lavender and blue. Mountain sorrel (Oxalis Montana), common east of the Mississippi in North America, has creamy-white blooms with pink or lavender veins that create a delicate effect resembling lace. Tricornered leaves in groups of three fold like an umbrella at night or on cloudy days. Slender, yellow wood sorrel (Oxalis dillenii) grows across much of the U.S. and throughout Eastern and the prairie provinces of Canada. Also known as upright yellow wood sorrel, it is a native of Europe. Plants grow to 15 inches tall, with bright yellow flowers and gray-green leaves. Common yellow oxalis (Oxalis stricta) is a North American native that grows less than 1 foot tall with fewer yellow flowers. Tufted yellow wood sorrel (Oxalis priceae) is a low-growing native of the Southeast. The West Coast redwood sorrel (Oxalis oregano) provides a lush ground cover of pale pink flowers in redwood forests. Southwest Oxalis species include blue wood sorrel (Oxalis caerulea) and pink-flowered broadleaf sorrel (Oxalis latifolia). Drummond's wood sorrel (Oxalis drummondii), native to Texas, blooms in pale lavender as does the violet wood sorrel (Oxalis violacea), native to the Eastern U.S. and Great Plains. Immigrant varieties in southern states include yellow Bermuda buttercups (Oxalis pes-caprae). Great yellow wood sorrel (Oxalis grandis) is listed as an annual by the USDA plants database although North Carolina State University's wildflower catalog lists it as a perennial. It is native from Pennsylvania south to Georgia and west to the Mississippi, grows between 1 and 2 feet tall and bears yellow flowers. Another plant that grows across the continent, known variously as creeping wood sorrel, creeping oxalis or yellow wood sorrel (Oxalis corniculata), also grows as an annual but is perennial in warmer zones. Some Oxalis varieties come indoors in March and grow as houseplants, sometimes for years. Purple wood sorrel (Oxalis purpurea), sorrel (Oxalis regnelli), window-box wood sorrel (Oxalis rubra) and good luck plant, also called lucky clover ( Oxalis deppei or Oxalis tetraphylla), all grow as perennials given proper care. Each type of "shamrock plant" dies back periodically and enters dormancy to rest before beginning another season of growth. Like their wild cousins, they die completely when conditions become too cold or too dry to support growth. What Plants Live in the Grasslands?